Especially good for healers who spam short cast spells (ie Priest w/ Flash Heal, Tree Druid spamming HoTs). Damage classes can normally find something better for their trinket slots and since it is a % on cast healers who primarily use long heals will not benefit nearly as much. Lets say spam of Heal Rank 2, 2.5s cast. 100 heals will occur in 250 seconds. It has a 2% proc rate, so in 250s it will proc 2 times. 1 proc will give you 100% regen rate inside 5 seconds rule. it has a 2 procs every 250s spaming heal rank2. or 375*2=750 mana in 250s or 4min and 10seconds. in the 250s, the shard of onyxia would give you 250*3.2 = 800 mana. The proc rate over a time span of 250 sec and 100 heals is 2.5. This makes more sence in theory, since the chance for the card to proc gets bigger as you use more spells. It's just like the 7.5 ticks over 15 sec, because here, you don't know if the card procs before or after a tick. There you have it. This is for a player with 250 spirit at 100% mana regeneration. I don't think mana regeneration can stack to more than 100%, if you have talents plus the card and what ever. Keep in mind that this is for constantly casting a 2.5 sec spell over a period of 4 min and 10 sec. Taking breaks and casting longer spells will reduce the chance of a proc. This is the only Darkmoon card that will scale well at 70 and beyond. Get your cards/deck now while people are still farming the instances, as soon as BC comes out prices will rise OR the cards will just never show up. % based items are the only ones that will still pull their weight at 70. At one point in time this card used to proc off of wanding and creating tradeskill items. It aslo used to stack with the 15% meditation and 3 piece transcendence bonuses, so you'd get 130% mana regeneration for the duration of the proc if you had both bonuses. Now, however, none of these work. If it procs, you get 100% mana regneration for the 15 seconds and that's it. People most compare it to the Mindtap Talisman out of DM West. The general rule of thumb is if you have 300+ spirit that this card pulls ahead over the long term. Be aware though that the % chance nature of this card makes it unreliable in that regard. Assuming Spirit levels rise with The Burning Crusade release, I expect this card to be much better long-term than the Mindtap Talisman. It should be noted that there are a few ways to take full advantage of this trinket. If you do no casting after it procs, you're really only getting 5 seconds of "benefit" out of the proc. That is not to say that you should just cast spells for the sake of casting them, but if anyone needs their health topped off now is the time to do it. Also, if you finish a spell just before the effect ends, you don't go into the 5 second rule afterward so you're effectively extending the benefit of this trinket. This trinket is also considered an excellent choice for people who are on decursing duties during boss fights. This is a very useful item for casters in my opinion. It can really help in a pinch in boss fights in endgame instances. If you have the money or are willing to farm for it, definitely go for it. I always hated this thing on my Priest. In fact, I totally gave up and ended up vendoring it for a few gold when TBC hit. I just found it far to random, it would proc when I didn't need it, and when it would have been life saving it never happend. Thats fine and dandy for a DPS class, but for a healer I need reliability and consistency, not unpredictability. I went with a pair of "lesser" trinkets, that give me reliable regen. The ability to upgrade these decks, or possibly the just the cards, has just been released. This is however due to come in patch 2.1. I'm awaiting what they will be like. Even at level 70 this trinket is very strong for a healer. A priest stacking spirit can easily regenerate over 1500 mana from a proc of Blue Dragon. Notably, this trinket scales with the rest of your gear, and also benefits from raid buffs (DS, Kings...). Pre-TBC I had over 600 spirit on my priest fully buffed making this trinket a veritable powerhouse - especially on fights where I was decursing. The trouble is making spirit work for you. You have to really pay attention to the 5-second rule, and heal in bursts. I'm yet to see a better mana-regen trinket for healers in long fights. I have that trink and usually (always) use it on boss fights and I'm doing damn good. In Gruul's Lair. I'm at 500+ mp5 so having that full mp5 during 15sec gives me back 1500 mana + (that doesnt count BoW). The only thing that I wonder now is : Card > http://www.wowhead.com/?item=28823#M0z cause once I find out what's the best. I'll either keep DKP or spend them on the eye. From a stylish point of view, this trinket goes very well with this earring. Rogues drool over big hitting onehanders. This combo is what a priest drools over. Yes, we're sad. But we're sad with full 0-100% mana in less than 20 seconds with this. I was thinking about getting this for my hunter. Has anybody tried it yet? Will the shots count as spells? Quick and dirty comparison from a ToL-Druids perspective, but useful for priests as well. - You have 3/3 Intensity. - During the fight, you are always in the five-second-rule (5SR. * You make full effect of the proc by saving the full 450 mana. * On one hand I assumed that you are in the 5SR throughout the fight, which is likely not the case. Of course spirit-based mana regen recovery through Blue Dragon and BoEB shines in this scenario. On the other hand one can argue that parts of a fight in which you are often not in the 5SR, are not that crucial anyway (from a healers perspective) and having 600 spirit will help you out there. * I assumed non-overlapping buffs. This would be harder to model, but would lead to a problem only with the Blue Dragon-Card, due to the internal CD of BoEB and consumption of the buff by the next cast with the Eye of Gruul. * You will be able to use the "Use" on BoEB a couple of times in a fight. You might innervate other players. But still: Different strokes for different folks! I'm a Balance druid with DS/Intensity, I use the BoEB for fights I know that are going to really tax my longevity, (always trying to prove I'm not an oomkin) and I am wondering if perhaps this trinket might be better for me. I know that the proc rates are about the same for each and that this trinket gives 100% vs the BoEB's 15%, but with the bangle's use feature I can innervate myself for a big boost. I really only find myself in a bind on fights where people have died mid way through the fight and I need to boost my dps and ignore conservation. I stack alot of int/mp5 gems and favor gear with heavy int and mp5. I would say if you have over 650 spirit fully raid buffed, the bangle isn't going to add anything to your innervate because the amount of spirit you have will top off your entire mana bar from 1-2K to full on its own. that being said, this trinket is just awesome for tree druids, specifically those tree druids who spend alot of their time in the MT group. I have 809 spirit fully raid buffed, and after 2.3, will have 889ish. i have 676 mp5 while not casting, which puts this trinket at 2028 mana per proc for me. Last night, about 3.5 hours of raiding, it procc'd 29 times, giving me approximately 58812 extra mana. Eye of Gruul doesn't even come close to comparing to it with the way I'm itemized. For example, during a 13 minute Alar fight, it procced 6 times, giving me 12168 mana, or 936 per minute, or 78 mp5. And it just scales up from there! There's hardly need for more calculations to prove to me the point that this is a great trinket for ambitious tree druids. I really want it for my druid. The problem that no one is discussing here is how to actually get it, assuming you weren't around pre-TBC. The required Ace of Beasts has, according to this website, a 5% chance to drop off the Beast, a boss in Upper Blackrock Spire. To even get there you need the Seal of Ascension, a key rewarded by a lengthy quest involving bosses inside Lower Blackrock Spire and a dragon boss in Dustwallow Marsh. The quest could reasonably be soloed by some 70's, particularly if they have stealth. As you can see the odds must be tragically low. Scam 2 other guildies (preferably some kind of rogue/mage combo) into farming it with you. You can probably entice them with promises of large brilliant shards, hehe. Had my spouse not found the entire deck on the AH two or three days before the weekend, this is what I had planned to do. You can three man farm it easily with the right combo. (809/4.5 +15)/2 * 0.7 *15 = 1023 mana from one proc. Still very good though and almost the same as Alchemist's Stone which gives 40 mp5 max when using super mana pots. Also, does it have inner cooldown or something? Edit : There is no inner CD on the proc after testing the trinket. It even procced while already having the blue dragon aura on me (already procced ), renewing the timer. Just remember that spirit-based mana regen will be increased in 2.4. This trinket will be almost OP. If you have the chance to snag it, don't hesitate. has come out, looks like i'll be retiring this trinket : ( it's served me really well though. Probably doesn't work so well on arcane mages compared to other classes coz due to Arcane Meditation (30% mana regen while casting) and Mage Armor (another 30%) this trinket effectively only adds 40% mana regen when it procs. I worked it out and got only 291 mana when it procs (assumed to be once every 3 minutes or so) which works out to be ~8mp5, compared to 43 and 29 mp5 respectively for the abovementioned 2 trinkets. Of course over different talent builds, classes and cast rotations, your mileage my vary. While a paladin or shaman's spirit based mp5 may be about half that of a priest or druid's, they also gain 30% more benefit from it, since the proc does not stack with priest/druid mana regen talents, so if this trinket is truely "OP" for priests/druids, 70%-80% of that should be at least a good trinket pallies/shammies. I just got it proc off of a Consume Magic. So it doesn't matter whether or not the spell actually uses mana. I have been farming this Beast now for about 4 months with 4 to 6 runs every weekend. We ran this with three level 70s. Over the course of 30 kills give or take 5, we got 7 Finkle's Skinner. Wowheads % drop is way off or I just have horrible luck. We also managed to pull out Alcor's Sunrazor, Felstriker, Skullflame Shield, Cloudkeeper Legplates in the course of those 4 months. The runecloth and Large Brilliant Shards made us a ton of money, more so then dailys. I ended up getting better priest trinkets and gave this to my wife (restoration druid). Now on to farm the Bangle of Endless Blessings. The 2.4 changes towards the regen from spirit, it's still not worth using that trinket over other options, like Tome of Diabolic Remedy or Fel Reaver Piston. I can't really understand why some people are shunning this trinket. My priest with some early Black Temple gear has, fully buffed, 408mp5 and about 1010 regen OO5SR. If the trinket manages to proc on average each 2 minutes (as I am a Circle of Healing priest, and cast a lot of instant spells) this means more than 3k mana each 2 minutes, while casting! This is more than a full Super Mana Potion! And I still can drink one to get me more 1.8 to 3k mana if needed! But in a nutshell this trinket for a healer with 510 spirit and 518 intellect is roughly equivalent to 125mp5. Is it me or this blue dragon is really having more proc after 2.4.2? so do you guys have some strange proc rate after 2.4.2? The cast time of the spell? I use this with my Tome of Diabolic Remedy and seldom ever run low on mana. It has a great proc rate, and often find myself seeing it proc multiple times as I spam CoH and renew on the raid. A definite must have before WOTLK, as level 80 druids/priests will have a lot, lot more spirit. I would say if you have over 500 spirit fully raid buffed, the bangle isn't going to add anything to your innervate because the amount of spirit you have will top off your entire mana bar from 1-2K to full on its own, without Bangle. So wearing Bangle would just be a wasted trinket slot in cases like that. Im not a theorycrafter so ive never actually done the math for this, but until I see the math I'd have to completely disagree with this. Tree druid I raid/clear Sunwell - Raid buffed I have probably about 7-800 spirit and while using this trinket with innervate would be a complete waste it is never off CD. I'll call that im stopping healing for about 10 seconds so the other healers know the raid will be lacking some hots... pop bangle and sit for about 5 seconds and get a really good mini-innervate from this - Every 2 minutes. Sometimes I'll pair it up with my essence of the martyr giving me a +healing +spirit buff on my hots when the raid is taking heavy aoe damage. I have DM:BD as well sitting in my bank but the use on bangle just seems so much better to me. Any theorycrafters feel like going through the numbers of mana you would get back popping bangle every 2min outside the 5sr? I think people are confused over the proc rate, lol. 2% does not mean 2 / 100 casts will make it proc. 2% means, well, as if you rolled a 100-sided die (yes they exist) each time you cast, and if it lands on 1 or 2 it procs. I just tested this trinket on my druid. Unbuffed, my regeneration is 678/251 mp5 while resting and casting respectively. 370 casts of lifebloom yielded 8 procs of this trinket. That's the cost of about 90.29 casts. it will "cheapen" LB by around 26 mp. These are calculations I did for myself, with my gear. I like this trinket. What I have proved with this is the following. First of all, the proc rate really is as advertised and does not appear to be modified for level 70 characters. Secondly, it really does make a difference. It may not appear as much, but this trinket is great for mana regeneration. Being obtainable without any need to access high end raid content is a plus. It took me from Karazhan to Kil'jaeden and I still will use it in wrath (which comes out tomorrow night). Lovely trinket, I recommend it for restoration druids. That is false, just watched it procc on my 80 priest. Have no solid facts apart from that though, but the proccrate seems to be the same 2% as before. Awsome trinket. 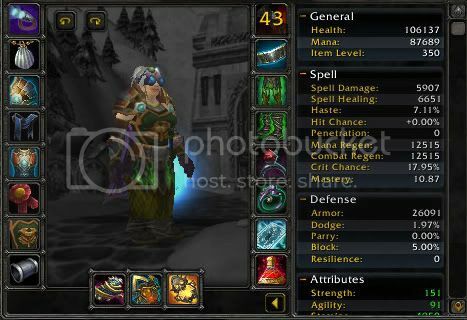 Pre-WotLK, I remember this item showing a diminishing mana reg rate, i.e. the 100% would decrease as the wearer progressed towards lvl 80. Is this not true anymore? Would this item still be one of the best even for lvl 80 characters? Do two of these trinkets stack? Its Unique, you can only have 1 of them on your character at a time. The card is unique. You can't use two. As a priest with a holy/discipline hybrid spec stacking spirit, i have recently grabbed this trinket out of my bank, and tested it together with the new Darkmoon Card: Greatness (spirit version). Amazing results ensued. Given the 33% uptime of the 300 spirit proc of the other card, you are bound to get uptimes of both trinkets together, resulting in massive regen. And that's without having to worry about the timing of the procs yourself. Accordingly to a few WWSs from raids I've done, the proc rate hasn't changed as some were fearing. Considering a 1200/500 mana regen (oFSR/FSR), it'd net 2800 mana per proc. Needless to say, it's still highly recommended. does anyone know if this has chance to proc on ever single pennace or only the initial cast? The debate is over Darkmoon Card: Greatness (+90 spir) and Darkmoon Card: Greatness (+90 int). The answer, regardless of class, is the same: Darkmoon Card: Greatness. If you are using both trinkets in combination, the +90 spirit from Darkmoon Card: Greatness will make the Darkmoon Card: Blue Dragon much more effective. Although intellect does slightly increase your mana regeneration rate, the primary thing that it does is to raise the size of your mana pool. Spirit, however, has much more of an effect on mana regeneration. Don't get me wrong- Darkmoon Card: Greatness has it's place, but it isn't here. The whole reason people use Darkmoon Card: Blue Dragon is for mana regen specs; thus, Darkmoon Card: Greatness wins the day. I have this trinket equiped on my 80 spirit-build priest. With 1200 spirit raid-buffed, each proc tics three times at 1100 MP5, so for each proc 3300 mana. I cast about 100-200 time in a 5 minute fight depending on debuff duty, so let's assume 150 casts. With a 2% proc rate that is 3 procs over the span of five minutes. (This is a conservative estimation). or in other words, THIS TRINKET is THE SAME AS A TRINKET THAT SAYS "Equip- 165 mp5"
and better yet, it will ETERNALLY and forever scale with your gear! It can only get better! In other words, this is easily the most OP tinket for spirit builds in the game. Even unbuffed it is still 115 mp5. Of course that is only if it procs, but it seems to proc a lot more then 2%... anyways, I'm glad my guild helped me farm this back in MC days as I walk around with the most SECRET, OP trinket in the game! Yes, definitely procs regularly for level 80s. Also seems to have no cooldown: my combat log from a Naxx/10 run shows it proccing twice in as little as two seconds. I am using this as a Resto Druid to run all end-game content in the game of this date. The math above is nice to look at, but simply put, this card procs at least once every other fight for me, and sometimes multiple times in one encounter. I don't have the time or the gold to get my hands on the greatness card, but Spirit-World Glass dropped for me last night and I'm really looking forward to having both equipped (at least for a boss set). I like the idea of activating Glass when Dragon procs, but will probably spam Glass as and when it's available. As they both lack SP and Haste I'm wondering about their usefullness during most trash pulls, where mana regen is rarely an issue. # Regeneration while not casting (outside of the “five second rule”) will be decreased. We think that (1) the ability to cast heal over time spells and then sit back and (2) benefitting from a clearcasting proc that also gets you out of the five second rule both provide too much mana regeneration, even over short time periods. # To make this change, we are reducing mana regeneration granted by Spirit across the board. However we are also boosting the effects of talents such as Meditation that increase regeneration while casting. The net result should be that your regeneration while casting will stay about the same, but your not-casting regeneration will be reduced. This change will have little impact on dps casters, since they are basically always casting. Which means that this level 60 trinket will no longer be best-in-slot for regen at 80. It'll be sad to put this thing into retirement after about two years of using it, but I suppose it's for the best. "– The amount of base mana regen granted has been reduced 40%. We called this “Spirit” in the notes, since most players associate OOFSR regen with Spirit, but in reality Int factors into the equation as well and we only lowered the constant, not the relative contributions of Int or Spirit. In retrospect, this probably caused more confusion than it alleviated, but mana regeneration is a fairly technical concept. – The effects of talents that provide mana regen while casting have been increased by 67%. This includes: Arcane Meditation, Improved Spirit Tap, Intensity, Mage Armor, Meditation, Pyromaniac, and Spirit Tap. For example, Intensity and Meditation are now 17/33/50% mana regen while casting (up from 10/20/30%). For most dps classes who never got much mana from OOFSR in the first place, the results should not be noticeable. Boomkin may be a possible exception because of Innervate, and we’ll take a look at that. – This should leave mana regeneration while casting (even the contribution of Spirit) relatively unchanged, but reduce mana regeneration while not casting by 40%." So, they will not be nerfing Spirit specifically in the next patch, but nerfing overall mana regen OOC. Which means in-combat, I expect my Blue Dragon to stay great. And, like some other posters, I can report that at level 80 this is proccing constantly, at least once a fight. Not unusual to end a night's raiding with 35-40 proccs in the WWS log. Unless it is changed to a higher percent, this is getting nerfed to the ground in 3.1, as OOC mana regen, upon which this trinket depends, is being significantly lowered. If you're trying to sell this on your server, be very specific about what this trinket can do, it's very hard to convince people that a level 60 trinket is still good at 80. 1) You don't have to worry about getting lucky on the uptimes of both procs. Given that the DC:G has about a 30 to 35% uptime and the DC:BD has approximately 15% uptime (varies depending on play style), it's not likely that they will be active at the same time very often. 2) Spirit-World Glass is free assuming you're farming Naxx-10 weekly, and DC:G decks are still going for an obscene amount on most servers. I am not exactly certain how much the upcoming 3.1.0 patch is going to nerf O5SR regen, but currently by timing the spirit use on my other trinket with the <Aura of the Blue Dragon> proc, I net about a 4k to 6k mana return each time (I roll with about 1200-1300 spirit raid buffed). Definitely recommended at level 80 for holy priests and resto druids during endurance fights. I still roll with spellpower and haste trinkets for trash and short fights. In patch 3.1 mana regen from spirit it being reduced, which in tern will make this trinkets noticeably less effective. With the upcoming changes to spirit regeneration is 3.1 (e.g. Meditation and Intensity going up to 50% of out-of-5second rule casting and the amount of non-casting regen being reduced to accommodate this for total regen being approximately the same) this trinket falls significantly in usefulness. I think this is getting severely nerfed due to the ooc regen changes in 3.1. Can anyone confirm? Post 3.1: Worst cast scenario, it gives around 1200 mana per proc, which is the same amount returned EVERY 5 MINUTES from Illusion. If Spirit World, Greatness, Holy Concentration or some other stat boosting trinket/ability is up, it's over 2000 per proc. Still no hidden cooldown. This trinket was so overpowered, that even post-nerf, it still kicks out more mana than anything else in-game. I use this trinket on my priest, both in shadow and holy+meditation spec, and I see it proc a lot more frequently in shadow spec, possibly due to the fast sequence of instant-cast spells applied to each new target. Essentially, it lets me save the talent points from improved spirit tap and still get frequent boosts to mana regen during fights. It also means I can keep most of my healing gear on (high on spirit) instead of having to get Mp5 + crit alternatives (or spending points in discipline to get meditation). All in all an excellent trinket for a shadow priest, possibly even more so than for a healer (and it's excellent for healers as well). As of a recent patch, out-of-combat mana regen from spirit has been drastically reduced. The difference between combat mana regen and out-of-combat mana regen is much lower. As a result, this item is much weaker, and is no longer the best mana regen trinket in the game. Soul of the Dead is now better, as I'm sure are a number of other items. For some example numbers: this item gives me an extra 200mp5 for 15 seconds, for a total of 600 mana, as a priest in Naxx and heroic gear at level 80. Comparatively, Soul of the Dead will proc at an equal rate if you have 8% spell crit chance, and more often if your crit is higher (which it probably is). For me, Soul of the Dead gives 50% more MP when it procs than Darkmoon Card: Blue Dragon does. Plus it gives extra crit rating, which is very nice. Je'tze's Bell on the other hand is still worse mana regen (about half as good for me), and procs exactly as often as this card, but has 106 spellpower. Since I have one set of equipment for spellpower and a second set for mana regen, I would probably not use the bell unless I didn't have any better spellpower trinkets than it. I'm not sure I understand your math. SotD returns 900 mana per proc, but has a 45s internal CD. Any Priest in decent gear is looking at 850/500 regen raid-buffed, so you're looking at a 20s proc of Blue Dragon returning 1400 mana. However, BD has no internal CD (procs will even overlap at times). I had it proc 4 times on Emalon tonight, 3 of those in a 90s period. Pop Spirit World and you can forget about SotD, or any other trinket, even coming close in terms of pure regen. Spark of Hope's proc is 140 mp5 if you're casting an average of 1.5 sec (or instant) spells. At 3 sec spells it's half that, 70 mp5, and if you have haste with your 1.5/instant spam (i.e., disc priest), it's more. 100 spirit is on top of that. Spirit World Glass is very situational, but consider that many fights have a break where you don't need to be casting right then. Off the top of my head in Ulduar, there are breaks on Razorscale (right after she lifts off), XT (heart phase), Iron Council if no one's taking Brundir's lightning squid, Hodir while running to ice floes, Freya between add waves if tank healing is covered, and all of Mimiron's phase transitions. In these cases, you're getting the full or partial benefit from the +336 spirit while not casting at all, negating the advantage of stacking SWG with this trinket. Now, assuming 600 base regen while not casting as a ballpark figure, let's see how much BD gives back. Assuming no ICD and an average cast time of 2 seconds, you'll see a proc on average every 100 seconds. Any class that has enough spirit for this trinket to matter also has a 50% mana regen while casting talent, so you're gaining 300 mana/5 while casting over what you'd normally have. You get 3 of those 5 second intervals, for a gain of 900 mana every 50 seconds, which is 18 mana per second or 90 mp5. So comparing: Spark of Hope is very clearly superior even before the spirit at any cast time (faster casts proc BD more, and also benefit more from spark of hope). The benefit of Spirit World Glass is harder to quantify, but assuming 1000 spirit and int (reasonable in Ulduar gear), you have a base spirit-based regen of 529 when not casting (and, presumably, half that while casting). The passive spirit effect on SWG will raise this by 44 while not casting, 22 while casting. The use effect will add an additional 172 mp5 while not casting, or 86 while casting. Assuming instant clicking of the trinket and constant casting, that's 344 per usage every 2 min or 14 mp5 for a total of 58 mp5 for the whole trinket. Assuming it's used intelligently, but adding an extra thirty seconds between uses to account for that, it's a gain of 23 mp5 from the use, or a total of 67 from the entire SWG. TL;DR: DC:BG is strictly inferior to the Spark of Hope by a considerable margin at all cast time averages. It is superior to Spirit-World Glass in all cases, also by a large margin . question.. would this trinket be viable for all healers/spellcasters or just those that utilize spirit? or even quite possibly i can start casting cheap and frequent instants which could cause me to proc this item for mana refil? "2% chance on successful spellcast to allow 100% of your Mana regeneration to continue while casting for 15 sec." In other words, you get same mp5 as if not casting when this procs. So..how often does it proc? as a drood with Gift of the Earthmother, and the soft cap for hasterating achieved, my GCD is 1sec. 2% proc chance per cast, means I have to cast 50times with 1sec. It will proc every 50sec. So.. this trinket will give me 699mana every 50sec, thats ~70mp5 on average while casting. I explained my math like this, so any druid can do it themselves. ... so its better then naxx mp5 trinkets, but worse then ulduar mp5 trinkets. maybe its nothing but for some reason i thought of "Blue Eyes White Dragon." Yu-gi-oh reference perhaps? Disclosure: i dont play yu-gay-hoe, nor do i condone the malicious act of playing said game. I can not be held responsible for any loss of relationships, reputation, friends, or family members resulting in the playing of this..."Game". With all this talk about this trinket great for healers, what about mages? I was wondering cause its available in the AH and just wanted to research before I investing in it. Just bought this on my holypriest, for offspecc. Got around 1050 mana while not casting. Gonna try it out and see how it works, i replaced it with normal:Sliver of pure ice. I prio spamming over quality heals. That was posted back in vanilla, Patch 1.12.1 to be precise. i do have a question but is tis trinket any good to a shammy healer ? Officially worthless. Has no affect whatsoever on proc, since there is only one kind of regeneration now. "I am the Blue Dragon: Magic, wisdom, power. Know them, wield them, for they are the tools of the wise and the brave." The Blue Dragon symbolises power, and how you use it. Without restrictions and self-control, power corrupts and taints. Power, knowledge and intuition infuse this card in the upright position. Corruption, tirany and madness infuse this card in the reversed position. I've been trying to work out if this is viable as a pre-raid healer mana regen trinket at lvl 85. To get the best out of the blue dragon proc, I will consider pairing it with . This has 245 intellect and gives 1425 spirit on use. To isolate the value of the blue dragon card, I will compute the mana regen for the two trinkets as a pair and then subtract the mana regen for the figurine on its own. Average time between casts is 2.5 seconds, meaning the proc occurs once every 125 seconds on average. Healer is in Pre-Raid gear, with 4080 Int and 2800 spirit with the dream owl and blue dragon trinkets equipped. I computed these numbers by adding up int and spirit on blue level 85 items (mostly the ones from justice point vendor), suitable enchants and buffs (e.g. flask and food buff). anyone with access to the beta, please tell me if these numbers are wildly inaccurate. Using the formula from elitist jerks, Mp5=(0.001+spirit*sqrt(int)*0.003345)*5 this gives 2991 MP5 regen from spirit out of combat, or 1495 mana regen from spirit in combat. This is ignoring other sources of mana regen. (Don't forget you get 5% of max mana every 5 seconds even if you have no regen from spirit, which will affect the amount shown in your character screen but that doesn't affect our calculations here. You can see the mana from spirit by hovering your mouse over the spirit stat in your character screen). Every 125 seconds (on average) the blue dragon procs. Suppose we immediately use the figurine. Then our spirit increases to 4225, and our mana regen from spirit increases to 4513 for 15 seconds (while both the darkmoon card and figurine are active). The figurine buff lasts 20 seconds, so we have an additional 5 seconds at 2256 mana regen from spirit. This gives (4513-1495)*15/5+(2256-1495) = 9851 mana every 125 seconds, or 392 mana per 5 seconds. In contrast, if we had only the figurine and not the blue dragon, we could get (2256-1495)*20/5 = 3044 mana every 120 seconds, which is 127 mp5. TL;DR version, The blue dragon is worth 392-127 = 265 mp5 at level 85 when paired with the figurine - dream owl. This trinket procs, you instantly throw down a Mana Tide Totem (350% spirit for 15sec), and activate your other trinket Core of Ripeness. How much of your mana pool could you potentially regenerate? Remember that the spirit trinket probably adds like 9000 spirit at the time of activation. Tried it out and casted till Blue Dragon procced. Then I quickly dropped Mana Tide Totem and I went from 2900 cmp5 to 12515 cmp5. Next test - To see how high I can get with mana regen (with or without proccing Blue Dragon). So I kept casting to have my Heartsong and my Blood of Isiset 333 proc, giving 200+ and 1512+ spirit. Then quickly pop Mana Tide Totem and screenshot. I wonder what this trinket does after 5s rule was removed..
Would this trinket still be good in Cata? its going for 15k on my server. Interesting theorycrafting going on about this trinket's viability at 85. Given Blizzard's stance on wanting people to keep upgrading their gear, however, I can't really see them continuing to allow the continued viability of a level 60 trinket in current endgame. I'd strongly advise against overpaying for this trinket - the party won't last forever. Yeah, they don't normally like to let old stuff stay as viable as this is. This trinket was arguably the best mana regen trinket through all of Burning Crusade and semi-viable through a lot of Wrath though, simply because they forgot about it. It hasn't been changed in the last 3 years so I doubt it's going to suddenly get changed now. It's always possible of course, but it was way more likely in Burning Crusade and didn't happen then. And it's not that expensive now. You aren't going to get banned or even warned for using an OP piece of gear, so there is no reason why you shouldn't use every tool you've got to succeed in any form of progression content. Just be prepared to replace it if/when it gets nerfed, and don't expect it to last forever. I tried this thing out on our 10man raid through Bastion of Twilight and Blackwing Descent. As a paladin healer, i had multiple instant casts and enough haste to cast divine lights in under 2 sec, so I really wanted this thing to work. One important fact is that this trinket CAN proc from Word of Glory, even though it is a manaless cast. In general I had a good time keeping up the buff - i would say I average'd to 1 PPM. During the twin dragon fight in Bastion, I saw it proc twice in the span of 20 sec - it fell off, then a few seconds later it procced again. I can definitely say this thing has no internal cooldown, just a very small chance to proc itself. My spirit, while fully buffed and healing is about 3808. This translates to 5503 mp5 out of combat and 3500 in combat. Whenever the trinket procced, my incombat matched my OOC - the 5503 mark. I cannot definitely say whether this trinket is better or worse then any other I have. Currently, I have a Jar of Ancient Remedies as my only 359 healing trinket ( i cannot afford the tsunami card). I think I will use this blue dragon card until I can get the one off Cho'gall - I firmly believe it outperforms the Blood of Isistet in terms of mana regen, which is currently my highest priority. Anyone done any testing 4.0+ on this card? With the change of combat regen? 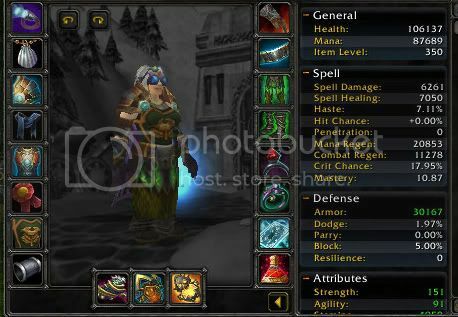 This was extremely powerful prior to 4.0.6, at least for Resto Shaman, because dropping mana tide during a proc results in much higher mana gains, and it had a chance to proc on each tick of puddle-type healing spells like Healing Rain (not one chance per target, one chance per wave of ticks), although it was impossible to tell if the proc was a result of the ticks, or a result of an Earthliving proc. It appears this may have been stealth-nerfed in 4.0.6. Post 4.0.6, it now appears that it ONLY procs on initial active spellcasts (i.e., no more procs on passive "casts" like Earthliving). The mana tide gains are still enormous, especially with high spirit, but the proc rate seems much, much lower for shaman. Healers with a lot of instant casts, like druids, may still find good use for it. Also, currently virtually worthless for Holy Priests, because their in-combat mana regen is already 80%. An extra 20% for about 20% of the time is not worth a trinket slot. EDIT: For people who want specific numbers, my resto shaman's unbuffed combat regen is 2714, and OOCR is 4259. For each proc of this trinket, that's 4635 mana. At about 1PPM, that's 386 mp5, which isn't amazing, but it's not terrible. However, under mana tide, my shaman's OOCR is 16612, and in-combat is 8891. That means that over the course of a mana tide, this trinket will optimally return an EXTRA 23k mana over what mana tide would normally give. If you use mana tide every 3.5 minutes or so during a long fight, that's 547mp5 from the mana tides alone. To sum up - for a resto shaman, this trinket can potentially deliver over 775mp5 in long fights. As gear improves through Cataclysm, these numbers will go up. Of course, the risk is that it won't proc, and you will get no benefit whatsoever. With the suspected stealth nerf I mention above, this bad outcome is far more likely, making this trinket very risky to use, considering that better and better regen trinkets will continue to drop. On the positive side, I see these on the AH all the time for about 100G, so it is a cheap way to get a passable regen trinket. Perhaps a by-product of folks leveling inscription? Looks like as of this week, April 2, Blizzard has nerfed proc rates for level 90 characters to absolutely 0. Went from a 20-25% uptime on raids to 0%. This recently got nerfed in a hotfix. Darkmoon Card: Blue Dragon now has a reduced chance to activate its effect for characters that are level 61-69 and its effect no longer activates for characters above level 69.